Watching James Kingston’s documentary “Don’t Look Down” made me realise for the first time that parkour was in my blood. While everyone around me was gasping in horror at James climbing cranes, I was in awe and wanted to leave the house that second to go out and start my climbing adventure! I’d class myself as unfit and when I started looking at women doing parkour I was feeling intimidated and started to realise that it might not be achievable for me. 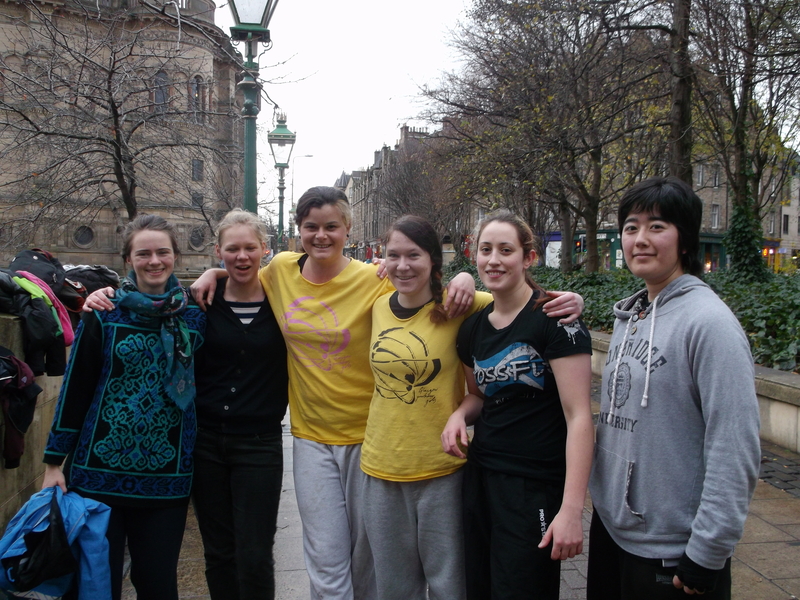 That was until I attended my first class with Glasgow Parkour Girls. The first evening I turned up full of enthusiasm and slightly terrified, but as soon as I met Kelley and Edith I knew I was going to have a great night. I struggled with some of the new things we were doing, like supporting my entire body weight with my arms (not going to happen for a while!). On the other hand, I found out that I had really good natural balance and I could land a jump. I went home black and blue but with the biggest smile on my face. Since having my first class a month ago, the camaraderie and support given by everyone who attends has kept me motivated and still so excited to continue my parkour journey. I’d encourange anyone who is thinking they’d love to do parkour but is apprehensive to come to a class. You’ll be amazed at what you can do naturally, and how supportive everyone is to help you achieve the things you’ll need to learn. I’m still very much a beginner but now the parkour part of my brain has been switched on every landscape is full of potential, and the world around me has become my playground. Parkour challenges me in a way like nothing else does. What I like most about it is the empowerment, that feeling that I can do anything (think superhero ninjas! don’t believe this though, I am only a beginner traceur!). Challenge is a concept that I have worked with in different ways in the past years and my thinking has evolved around the idea of failure a lot. To me, challenge is inherently associated with failure. This is not where it ends, only the beginning of a journey and how I deal with the idea of failure is the massively important thing. This is where motivation and persistence come in to play. Admittedly, this is not what I always thought. In the past, I would give up on something without actually trying because I was too afraid of failing. Or I would try once, decide that it wasn’t for me and just give up. I couldn’t stand not being good enough and I didn’t take criticism well, so I preferred not to face it at all. This is what I now consider to be a “I do not actually want to do it at all” approach. It means that if we give up, the thing we were attempting was not that important to us in the first place. Ultimately, most of the things we do in life are our choice. We choose to do them because we want to do them. And so we come up with ways of getting ourselves where we want to be. Otherwise, we come up with excuses to not do them. So if something is important enough to me I will keep at it no matter what, and failure is just a step on the way. It happens, but I keep going and try again. I have been discovering with parkour recently that I am often more capable than I thought I was. Quite often I will need a lot of encouragement and sometimes I might be the last person to believe that I actually can do something. A recent example would be a training session where I was doing relatively easy jumps just because I didn’t realise I could do bigger ones. The discovery that I can do more was pretty exhilarating. And it brings up a question of how often do we operate within our perceived limits only because we don’t realise we are capable of so much more. So say we decide that we *do* want to do something and we stick at it. We keep failing repeatedly over time and we might start wondering why we actually want to do it. Betterment is one of the reasons for me. If I become a little bit stronger, a little bit faster, this is already great. Some days I don’t feel like I’m improving at all though. But on these days, I find that the best reason to do parkour is just the sheer pleasure of movement. The satisfaction I get from just being in my body and interacting with the environment around is a reason enough to go out and train. If you’re in Edinburgh, make sure to head along to an Access class! And to say hi to Anna! 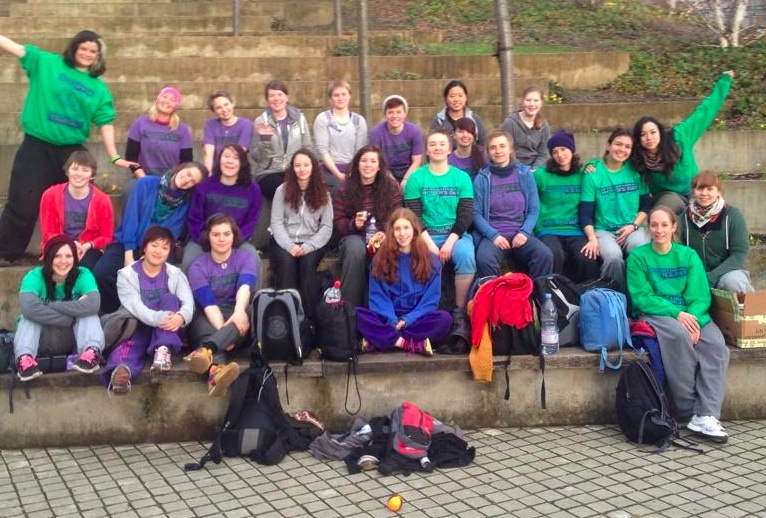 We’ve launched a crowdfunding campaign to get women qualified to coach parkour in Scotland!! And share the link far and wide!! This campaign will mean we’ll have a woman coaching in Scotland, and it’s only the beginning! Superchared thanks and infinite gratitude to those who have already donated!! It is something everyone knows, unemotionally and as a matter of fact. You only have to pass through a small opening, a blocked corridor, swing over a handrail or on a balcony high enough to provoke vertigo for the body to become alert. The body knows by itself how to say I. It knows to what extent I am on this side of the bar, and when I am outside. It judges deviations from normal balance, immediately regulates them and knows just how far to go, or not go. Coenesthesia says I by itself. It knows that I am inside, it knows when I am freeing myself. This internal self proclaims, calls, announces, sometimes howls the I like a wounded animal. This common sense apportions the body better than anything else in the whole world. From The Five Senses, a Philosophy of Mingled Bodies (I) by Michel Serres. 1) The beginning. Standing in the rain in the Glasgow at Clydeside surrounded by 40 other women warming up at the start of the Clamjamfrie. I have never seen that many women training together in Scotland before, and what was even more brilliant was that I knew maybe about five of them. There was so many new faces: some people that had travelled across Europe to be here, some from other Scottish communities and (for me most excitingly) women from Glasgow, who had never done parkour before but they were out there in rain giving it a try for the first time. 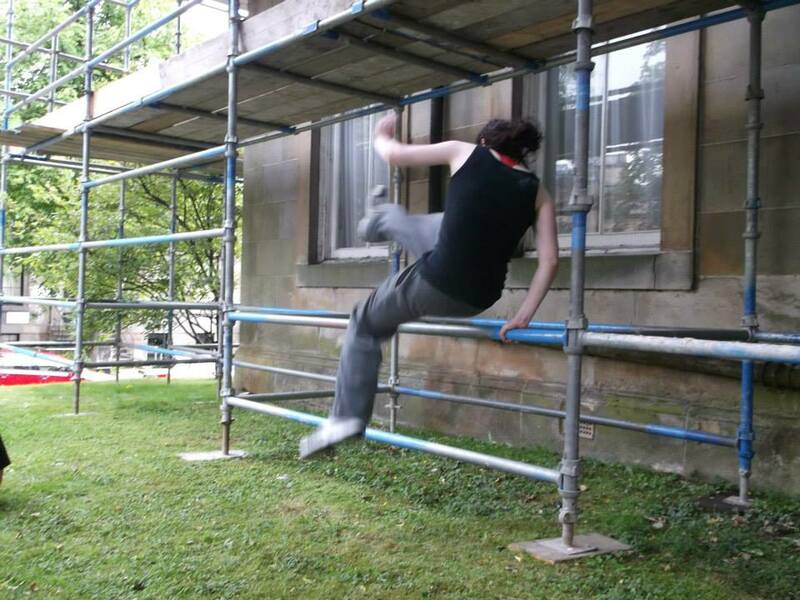 I think that it would be fair and honest to say that it has been hard in the past to get women involved in Parkour in Glasgow. They often say that they are interested and would love to give it a try, but that they are scared or don’t think that they are strong enough or they don’t have the time,. So getting all these new and unfamiliar faces together for the first time is a massive achievement. 2) The Coaches A massive thank you needs to go to all the coaches. It was great to have so many different coaches with a massive amount of expertise to share with the participants. They bought new thoughts and ideas about how to train, new exercises and games to play, and new eyes to Glasgow’s walls and rails to see new jumps and challenges that we hadn’t spotted in the past. 3) Watching everyone push it seriously hard at the end of day one, despite being exhausted. It might be a bit of a parkour cliché but at the end of a hard and challenging day everyone worked super-hard in the conditioning. I don’t think that I will ever stop finding this impressive. 4) Teaching people something different. I was lucky enough to teach a bit of aerial stuff on day two. Everyone I taught was massively enthusiastic, despite their sore hands. Some people achieved their first first rope climbs or meathooks, and that was seriously impressive. But there were also great teachers doing contemporary dance, handstands, barefoot running and strongwoman. And from all these things you can take what is useful and leave the rest, and maybe find that some of the rest is useful at some point in the future. 5) The seemingly endless supply of protein bars. YUM! 6) The girl, whose name I can’t remember, who left halfway through day two, because she had to go and rescue a seal. I know that that seems a little weird but I’m pretty sure that it wasn’t an elaborate excuse to get out of conditioning and that it was actually part of her job. She told me that she was very sad that she had to go because she had had an amazing morning and had done lots of things that she never had thought she would be able to do. And that’s wicked, because that is ultimately what these events are about; to get people involved and to help them to prove to themselves that they are more capable than they ever thought they were. 7) The lovely Kel and Fiona. And thank you most of all to Kel and Fiona for organizing this event. It was a massive event not just for women’s parkour but also something that the rest of the parkour community in Scotland should be supporting and celebrating. I am certain that it will only make our community stronger for the future. Happiness. For those who haven’t heard, Glasgow Parkour Girls will be hosting a 2 day training event for women* only. We thought it would be appropriate therefore, to take this opportunity to directly address a question we are regularly asked: why don’t you let men train with you? Firstly, we’ll begin by pointing out that this isn’t a hundred percent true. We do train with men. We actually quite like (training with) men! Some of our favourite (training) people are men. But it is true, that there are some times in our training (like girls’ jams, girls’ class or the above mentioned Clamjamfrie), where we aim to have women only spaces. We do recognise that a hundred percent women only space is not always feasible in parkour. We train in public spaces, and we know therefore that men may be at out spots. We also recognise that we may bump into male practitioners while out training, we share the same spots after all! And we don’t mind that. Despite the fact girls jams are advertised as women only, we would never make anyone unwelcome. As many of you know, there are no women coaches in Scotland at the moment, so girls’ class is always taken by a male coach. However, we believe it is important to strive for women only training spaces sometimes, and we think it is important that we are allowed these spaces. Anecdotal evidence and research has shown that many women feel uncomfortable training alongside men. This is due to many complex and intersecting social issues. Parkour, and sport in general, is often portrayed as a masculine pursuit. The media image of who does parkour often features a large, muscular man, who can easily perform feats that require incredible mental and physical strength. While this image is alienating to potential practitioners of all genders, it is particularly relevant to those who are not men. A women only environment allows women to try parkour in a more relaxed atmosphere, were they may feel less self conscious or nervous. Female athletes face different issues in their discipline to their male counterparts. There are general physical differences, such as strength, distribution of weight, body shape, etc. For example, many parkour women have a different understanding of climb ups: most beginners lack the upper body strength to learn them, and many women find their breasts to be a hindrance to the movement. Many women menstruate, which can effect their athletic output over their cycle, but this is very difficult to discuss, let alone get advice on, from male coaches. It’s not just physical differences that are present, but also mental ones too. In my experience, women face more fear and self-doubt, many women are turned off by competitive or aggressive tasks (such as ‘chase situations’). While this is a generalisation and not essential to every female practitioner, these differences (which are due to the socialisation of young children) are present in many women practioners. Some people have suggested to me that the creation of women only spaces is unfair to male practitioners. I don’t think so. Women are in the minority in parkour, and there have been many times when I’ve gone out training and been the only women there. As a friend and (male) practitioner once said “Every jam is a boys jam”. Women’s uptake and participation in sport in general is lower than men. The reasons are complicated, and often to do with societal ideas of gender roles. For example, even from a young age we encourage young boys to play rough and get muddy, where as young girls are often presented with gentler sports, or even discouraged from sports entirely. Women face different societal pressures which men do not, and these act as barriers to women’s participation. Therefore creating women’s only spaces seeks to readdress that imbalance and allow more women to comfortably enter the discipline. I don’t think women should only train together for all of their training. I think training with a wide variety of different people is important to develop in parkour. However, I would have never started parkour if there hadn’t been the option of a Girls’ Class, and it took me a while before I felt comfortable to train with men. Because of this I will always advocate for women only training spaces. I know how amazing and helpful the male community is, but I understand the feeling of intimidation towards training with a large group of men. I would hate for someone to miss out because they didn’t have a chance to fall in love with parkour because there wasn’t a situation where they felt comfortable to do so. In a perfect world we wouldn’t need these spaces, but we don’t live in that world, not yet. And until we do women only spaces are important to attract new practitioners and strengthen the women’s community. We have a new video! Made for us by Paul Sayer, we have a little video of one of the classes with GPC. Despite it being a soggy night, it’s a lovely video. Give it a watch, then come out and play with us!